Who do you turn to when desperate situations call for desperate measures? If you're Betty Cooper and Jughead Jones your only option is the shadiest character in Riverdale - Reggie Mantle. Archie is still under Veronica's spell and his friends have to enlist some help to pry him away. Mark Waid continues to shine with this modern update that pays homage as well as offering new layers to some familiar characters. Veronica Fish takes over the art duties and immediately shows why she belongs on this flagship series. Waid has the ability to flesh out the personalities beyond the labels they've carried for decades. Archie is much more than a loser, in fact he's self-aware and recognizes his friends' plans to interfere in his relationship with Veronica. Veronica can be viewed as the villain, rich and spoiled, but Waid occasionally allows her to let down her guard and expose her vulnerabilities, trying to fit in. It makes scenes like her dancing with Archie the more rewarding knowing that she appreciates his company and she's not just using him. Equally impactful are the reactions from Betty and Jughead seeing them together that perhaps there's more to Veronica than they've been willing to admit. Betty's melancholy resonates in her face, an example of Fish's ability to convey emotion with a single look or posture. Reggie is just the right kind of conniver to help plan to separate Archie and Veronica but he's not as slick as he thinks he is. Waid could have played up his cooler-than-cool persona straight but as with other characters he lets some humility peek through. It's these type of character arcs within an issue that makes the new Archie more character-driven than plot driven. There are shades of gray to everyone and their interactions feel authentic and sweet but still as fun as ever. Taking a classic title with well-established characters is no easy task but Waid has masterfully made the Riverdale gang as engaging and appealing as ever. As for Fish, following Fiona Staples and Annie Wu is no small task either. Fans need not worry because the smart people at Archie Comics just found the next great artist in Fish. It's hard not to compare her work to Staples but Fish does some wonderful line work and designs that fall in the same league with the award-winning artist. Andre Szymanowicz and Jen Vaughn infuse the panels with amazing color choices with deliberately thoughtful and varied shades. How they make the wardrobe pop is especially inspired and modern. When I started this review I thought the issue was good but after going through the pages and reexamining the scenes and the interactions between the characters I may have been a little too conservative. The thoughtful approach to writing these teens is nothing short of endearing and the updated look remains extraordinary. 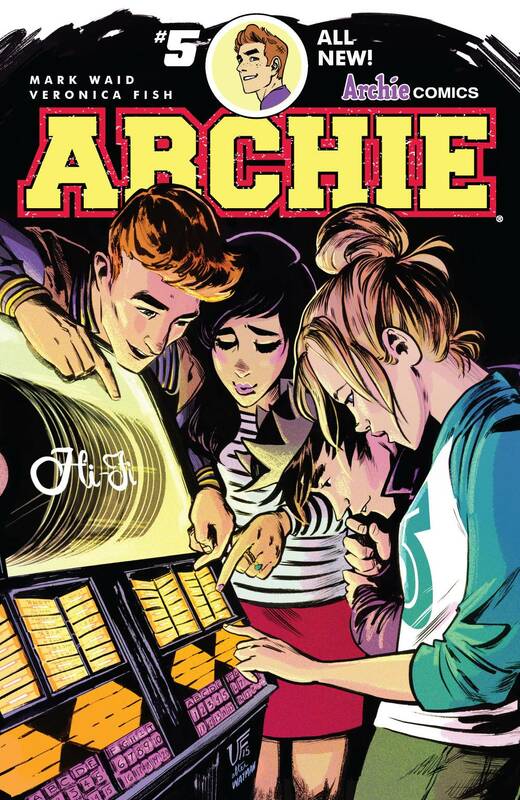 'Archie' #5 is one of the best issues of the run so far and if Waid and Fish can remain a duo for a while it could very well be one of the best collaborations in comics.